The Performing Arts Centre at Redmaids’ School, the oldest continuously operating all-girls’ school in the country (from 1634), was the venue for our concert on a lovely autumn day. We settled down for an afternoon of light classical and popular operatic music performed by some of the most talented young musicians in the area. They had been brought together by Angela Hickey, a leading local voice teacher who had a long and distinguished international singing career, appearing in many opera houses and concert halls all over the world including Poland (Warsaw and Łódz). Pianist Helen Reid played throughout, mostly as an accompanist but also performed some lovely solos, introducing many of us to Szymanowski’s preludes and giving us a magnificent bravura rendering of Chopin’s stirring first Ballade. Violinist Anneka Sutcliffe performed some of the loveliest violin solos in the repertoire, including Massenet’s ever-popular Meditation from Thais, the Tango in D by Albeniz and those Elgar ‘plums’, Chanson duMatin and Salut d’Amour in which she produced some ethereal sustained high notes. 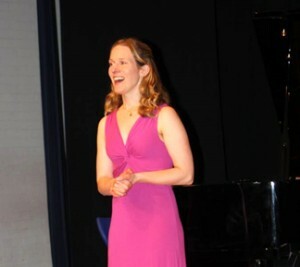 The two sopranos, Hayley Guest and Laura Curry, both studying with Angela, presented a wide range of arias and songs. Hayley began with two Handel arias, her high soprano effortlessly negotiating the technical demands of these challenging pieces. Later she sang one of Despina’s arias from Mozart’s CosiFan Tutte and a group of English songs by Parry, Head and Vaughan Williams. Laura, a radiantly-voiced lower soprano, gave us a mixture of arias and songs, including a wonderfully poised rendering of that Dvorak gem, O Silver Moon. She combined with Hayley for duets from operas by Mozart, Delibes and Offenbach, including those Classic FM favourites, the Flower Duet from Lakme and the Barcarolle from The Tales of Hoffman. Laura also sang the heart-stopping Morgen by Richard Strauss, with its most moving words, accompanied by Anneka, as well as by Helen.